CAMBRIDGE, Mass. — Conquistadors from Spain came, they saw and they were astonished. They had never seen anything in Europe like the bridges of Peru. Chroniclers wrote that the Spanish soldiers stood in awe and fear before the spans of braided fiber cables suspended across deep gorges in the Andes, narrow walkways sagging and swaying and looking so frail. Yet the suspension bridges were familiar and vital links in the vast empire of the Inca, as they had been to Andean cultures for hundreds of years before the arrival of the Spanish in 1532. The people had not developed the stone arch or wheeled vehicles, but they were accomplished in the use of natural fibers for textiles, boats, sling weapons — even keeping inventories by a prewriting system of knots. Dr. Ochsendorf’s research on Inca suspension bridges, begun while he was an undergraduate at Cornell University, illustrates an engineering university’s approach to archaeology, combining materials science and experimentation with the traditional fieldwork of observing and dating artifacts. Other universities conduct research in archaeological materials, but it has long been a specialty at M.I.T. The first steel section, top, being installed on the Verrazano-Narrows Bridge in 1963. The last remaining Inca bridge in Peru, center, was the model for the M.I.T. bridge project. John A. Ochsendorf of M.I.T., above, showing cable made in Peru. Students here are introduced to the multidisciplinary investigation of ancient technologies as applied in transforming resources into cultural hallmarks from household pottery to grand pyramids. In a course called “materials in human experience,” students are making a 60-foot-long fiber bridge in the Peruvian style. On Saturday, they plan to stretch the bridge across a dry basin between two campus buildings. In recent years, M.I.T. archaeologists and scientists have joined forces in studies of early Peruvian ceramics, balsa rafts and metal alloys; Egyptian glass and Roman concrete; and also the casting of bronze bells in Mexico. 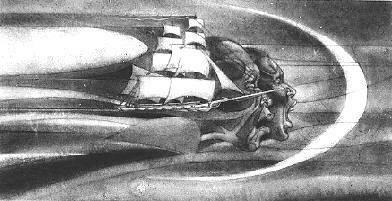 They discovered that Ecuadoreans, traveling by sea, introduced metallurgy to western Mexico. They even found how Mexicans added bits of morning-glory plants, which contain sulfur, in processing natural rubber into bouncing balls. From this perspective, she said, the choices are not always based only on what works well, but also are guided by ideological and aesthetic criteria. In the casting of early Mexican bells, attention was given to their ringing tone and their color; an unusually large amount of arsenic was added to copper to make the bronze shine like silver. “If people use materials in different ways in different societies, that tells you something about those people,” Professor Lechtman said. In the case of the Peruvian bridges, the builders relied on a technology well suited to the problem and their resources. The Spanish themselves demonstrated how appropriate the Peruvian technique was. 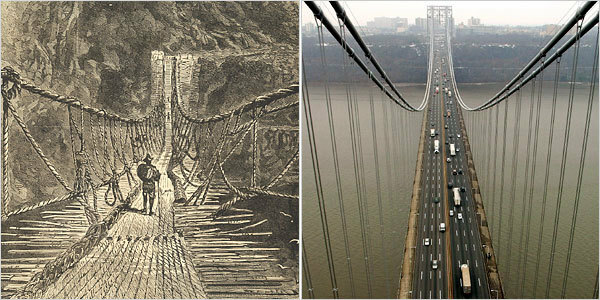 Dr. Ochsendorf, a specialist in early architecture and engineering, said the colonial government tried many times to erect European arch bridges across the canyons, and each attempt ended in fiasco until iron and steel were applied to bridge building. The Peruvians, knowing nothing of the arch or iron metallurgy, instead relied on what they knew best, fibers from cotton, grasses and saplings, and llama and alpaca wool. The extraordinary watercolours of John White gave the Elizabethan world its first glimpse of America, ultimately shaping its view of the New World. This exhibition focuses on more than 70 watercolours made by White on the voyages to Virginia (now North Carolina) in the 1580s. These images are the earliest visual record by an Englishman of the flora, fauna and people of America and provide us with an idea of how fascinating this strange New World must have been to Europeans of the late 16th century. The exhibition also features a selection of Elizabethan portraits, maritime and scientific instruments from the period, alongside historic maps, books, prints and other exquisite objects which relate to Elizabethan navigation and capture the excitement of this golden age of exploration. A New World looks at the lasting impact John White's watercolours had on the Old World's impression of America. His legacy continued for over 250 years after his death thanks to the reproduction and adaptation of his work by later artists, a selection of which is displayed in the exhibition. Exhibition supported by The Annenberg Foundation. 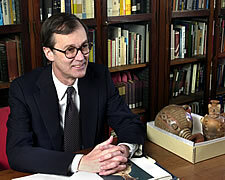 Generous support was also provided by the American Friends of the British Museum and Mr Francis Finlay. 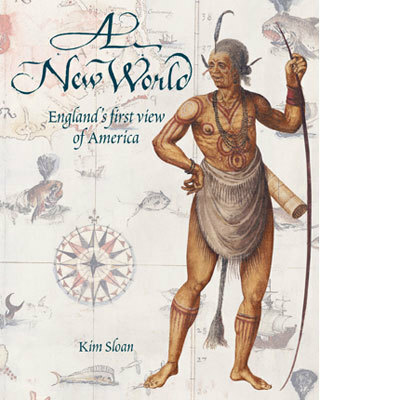 A new exhibition opening at the British Museum on Thursday provides an opportunity to see the artworks that were largely responsible for shaping England’'s initial idea of America. The centrepiece of the exhibition is a collection of watercolours by John White, who travelled to America with Sir Walter Raleigh in order to document the New World. 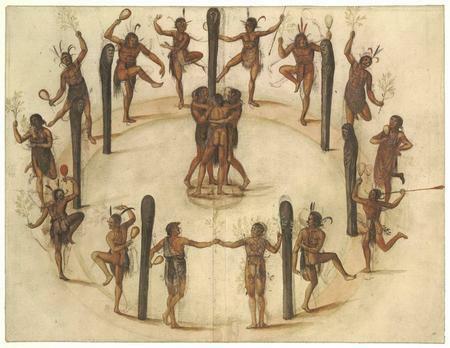 White's fascinating pictures of the complex and sophisticated culture of the North Carolina Algonquin Indians and the landscapes, wildlife and plants of 'Virginia' (what we now call North Carolina was named by Raleigh for his queen) are the only surviving original visual record of this period of America’s history. 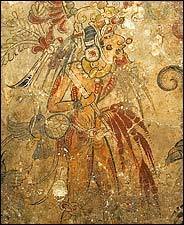 Although the paintings are all part of the British Museum’s collection, they are being displayed together for the first time in 40 years. They’re accompanied by artefacts – portraits, maps and navigational instruments – loaned by the National Portrait Gallery, the British Library and the National Maritime Museum to set the scene at the Elizabethan court in a display that marks the 400th anniversary in May of the first permanent Jamestown settlement. The exhibition also provides a glimpse of the earlier ‘lost colony’ of Roanoke. Although relatively few facts have come to light about John White, it is known that he was part of a second expedition dispatched by Raleigh after an initial fact-finding voyage in 1584. Accompanying Thomas Harriot, Raleigh's tutor in navigation, a linguist, recorder and surveyor whose task was to establish the land’s potential for farming and trade. White’s job was to produce visual records and maps in order to drum up investment and entice colonists prepared to found an English plantation. The 1585 voyage anchored off the outer banks of what is now North Carolina built a small fort on the island of Roanoke, surveyed the coastline and brought back to England reports and pictures of the site they deemed the perfect place to start an English community. Preparations were made for a permanent colony of 115 men women and children at the 'Cittie of Raleigh' on the Chesapeake and John White was appointed their governor with 12 assistants. But when the new expedition set off in 1587 it landed at Roanoke with insufficient supplies. White was obliged to return to England to get assistance but once there he found that, because of the Spanish Armada, his relief ships were denied permission to sail. When he finally made it back to North Carolina, three years later in 1590, no trace of the colonists remained and the legend of the 'lost colony' of Roanoke – the subject of much intriguing internet debate – was born. The Middle Passage is the name given to the dangerous sea leg of the slave trade, across the Atlantic Ocean from the west coast of Africa to North and South America and the Caribbean. It is also the subject of this astonishing suite of 52 black-and-white drawings by the African-American artist Tom Feelings, who died in 2003. The drawings took Mr. Feelings, a Brooklyn native, more than 20 years to complete. Composed through the unusual process of layering tissue paper over watercolor imagery, with pencil and tempera highlights, the drawings are smoky and ethereal. But the acrid content belies the softly beguiling presentation. Mr. Feelings indulges in no lazy romanticism of Africa, depicting the origins of the slave trade in local tribal conflicts. Several drawings show African kings assembling and trading slaves with the Europeans for guns, molasses and rum. The most affecting images illustrate the suffering and desperation of the captives on board the slave ships. There are countless images of them being force-fed, beaten and raped, of their bodies chained and pressed together, back to belly, in the putrid bowels of leaky hulks. Helpful spirits, essential to the good life, didn’t come easily to the clannish peoples of the Gulf of Papua. They had to be coaxed. And in the coaxing lies the history of Papuan art, a religious pursuit entirely devoted to making masks, figures and spirit boards for habitation by the powerful local gods whose intervention was sought for success in hunting, harvesting, warfare, trading and treating the sick. How the Papuans practiced their beliefs on the remote Pacific island of New Guinea in the late 19th and early 20th centuries, when they still had little contact with the West, is the complex and fascinating story told in "Coaxing the Spirits to Dance: Art of the Papuan Gulf" at the Metropolitan Museum of Art. This exhibition of some 60 objects and 30 rare photographs of the works on site or in actual use is the first comprehensive study of the material, the Met says, since a pioneering survey in 1961 mounted by the former Museum of Primitive Art in New York. The current show was organized by the Hood Museum of Art at Dartmouth College, in collaboration with the Met, and the New York presentation was put together by Virginia-Lee Webb, the Met's research curator in the art of Africa, Oceania and the Americas. The art reflects the Papuan social order, which was based on families, especially those whose ancestry was identified with particular rivers and places. Each family’s totemic emblems and legends spoke of its land and spiritual heritage. The men in the society kept the traditions and made the art. They lived in long houses, apart from their women and children (who were forbidden to enter). The long houses, long huts with individual cubicles, served as communal residences as well as performance halls for the spirit-coaxing dances, and also provided a place for clan shrines, maintained to preserve each family's tree. 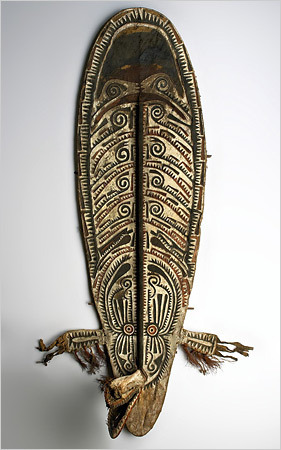 The carved and painted "spirit boards" made throughout the gulf region, on the south coast of present-day Papua New Guinea, are probably the most easily recognized of the area's traditional artworks. Each board was meant to serve as a home for the rain forest or river deity embraced by a particular clan. Their central designs, passed down from fathers to sons and through marriages, typically represent a bush or river spirit, with a heavily stylized face and perhaps a small body, surrounded by various totemic symbols. 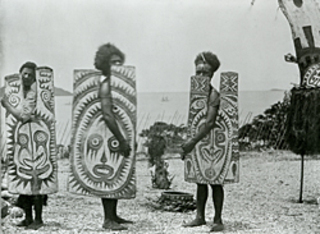 The show's many photographs depicting Papuan customs, habitats and arts were mostly taken by the anthropologists and photographers who visited the area as Christianity was beginning to take hold at the end of the 19th century. More than a few depict objects in the show in their original settings, like a cheerful Wapo spirit board that was placed on pig skulls in a long-house shrine, snapped in 1930 by the Swiss anthropologist Paul Wirz. The dean of Papua's photographers, however, was an Australian, Frank Hurley (1885-1962), best known for his images of Ernest Shackleton's ill-fated expedition to the Antarctic in 1914. The first to use cinematography and aerial photography in the Gulf of Papua, Mr. Hurley collected objects and photographed places that no longer survive. His aerial view of Kaimari villages on the Purari Delta in 1922, shot from about 1,500 feet, gives a vivid idea of the territory and its watery byways. 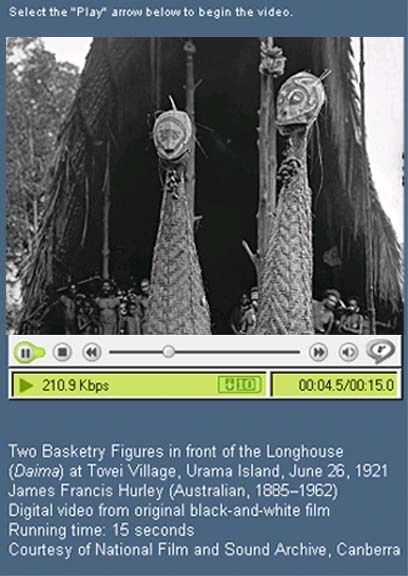 Each of these two video clips shows a digitized sequence from the original silent film by Frank Hurley entitled Pearls and Savages. Both masked performances were reenacted at Hurley's request. Hurley also made still photographs of the masks, two of which are included in this exhibition. CHANCAY, Peru--Japanese researchers said they believe they have discovered--with the unintended help of looters--the ruins of a temple at least 4,800 years old that could be one of the oldest in the Americas. 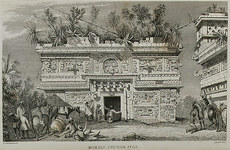 The temple was likely built before or around 2600 B.C. when Peru's oldest known city, Caral, was created, the researchers said. The discovery was made in the ruins of Shicras located in the Chancay Valley about 100 kilometers north of Lima. The team started full-scale excavation work on Monday. There are two 10-meter-high pyramid-shaped structures made of stone running north to south for about 50 meters and east to west for about 30 meters, according to Tetsuya Inamura, professor of cultural anthropology at Aichi Prefectural University who is part of the excavation team. Experts said they hope the discovery will shed light on the origins of ancient civilizations of Latin America. "It can be regarded as a structure built using organized labor," Taiken Kato, professor of cultural anthropology at Saitama University, said. "If the excavation could confirm urban developments in a wide range of coastal areas in Peru, it would contribute to unraveling the formation of the Andes civilization." In August last year, Hiroshi Sakane, chief curator of the Lima-based Museo Amano, and Masami Fujisawa, professor of seismic engineering at the Tsukuba University of Technology, found the ruins in a 4-meter-wide, 8-meter-deep pit apparently made by looters. The Amano museum was established by Yoshitaro Amano who spent his life collecting artifacts of the Chancay culture. When the two researchers looked into a section of the pit, they found reed bags filled with stones and pebbles that were used as reinforcing material, scrapings of charcoal and fibers, and other items. 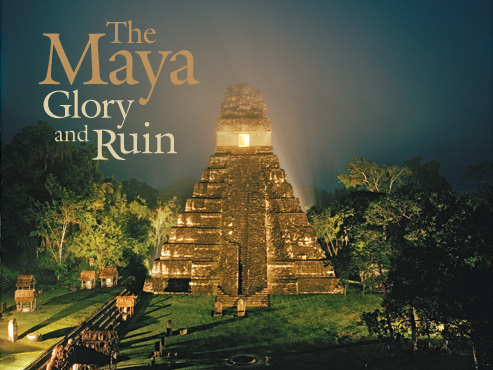 The researchers said the ruins were likely part of a religious facility, possibly a temple, because of the complicated construction method used and the traces of fire apparently used in rituals. Radiocarbon dating showed the reinforcing materials and scrapings of charcoal and fibers were up to 4,800 years old. There are also indications that the structure underwent reconstruction work seven or eight times. A team comprising Japanese experts on archeology, cultural anthropology, seismic engineering and other fields, as well as a Peruvian archeologist from the Amano museum, was granted permission to excavate the site from the Peruvian government. The past 10 years have yielded some remarkable findings at the archeological site in Caral, about 150 km north of the ruins, including a temple at least 30 meters tall built with gigantic stones, as well as a group of at least 30 large buildings. 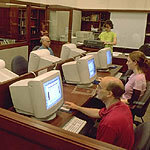 This posting is an experiment in providing timely access to the contents of journals received in the Goldwater Library. We will continue to send the monthly email "New Arrivals", which includes a list of journal issues received, for the foreseeable future. 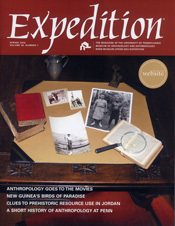 "By paying attention to the relationships responsible for the production of hats decorated with bird of paradise plumes we can suggest alternative understandings of New Guinea's history..."
Concentrating on : "the Department's protohistory in the 19th century, closely associated with the founding of the Museum; the Department's formal beginnings in the early 20th century; and its revival after World War II, which effectively gave rise to the present Department." Saturno and his team plan to continue excavating at San Bartolo for years to come. "This is a tip of iceberg," he said. "The site is one square kilometer [0.4 square mile] in area. This room we've spent so much time in … it's a four-meter-by-nine-meter [13-by-30-foot] space."